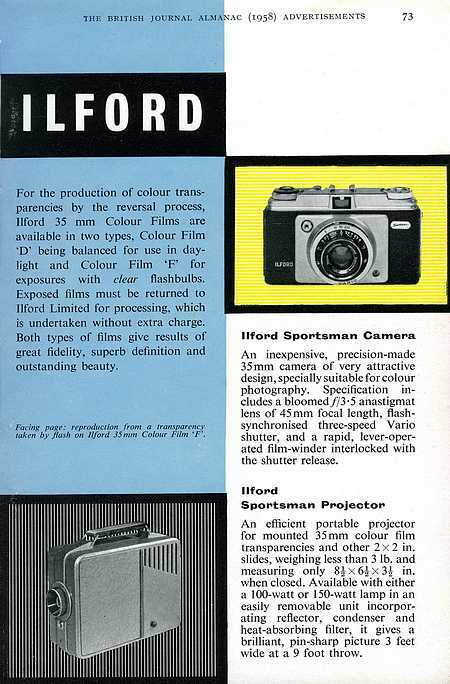 This page illustrates 35mm slide projectors branded ILFORD and sold to compliment the ILFORD Sportsman camera range which went on sale from 1957. From the mid-1960s to the end of 1969, Ilford acted as UK distributor for a range of equipment from the Elmo Company Ltd, Japan. Mostly this range consisted of cine cameras and projectors, but included at least one 35mm still slide projector, the Ilford Elmo CS. See it on my Ilford Elmo web page. The British Photographic Journal Almanac for 1958 (hence, referring to newly arrived 1957 equipment) contains one of the first Ilford adverts for its (1957) Sportsman camera together with a 35mm slide projector, also named the Sportsman. Modern Camera Magazine reviews the Sportsman Portable Projector in their April 1957 issue. They gave its measurements when closed for travelling, with leads tucked inside, as only 8ins (200mm) by 6ins (150mm) by 3ins (75mm). In 1957 it was priced at £12.3.9d (£12.19p) including a lamp. The description applied by Ilford to the compact Sportsman projector can be read in the BJPA advert, alongside. Modern Camera's review text can be read below. They were impressed with it. The Sportsman camera and slide projector complimented Ilfords colour transparency film Type 'D' (introduced 1948) and Type 'F' (introduced 1956). 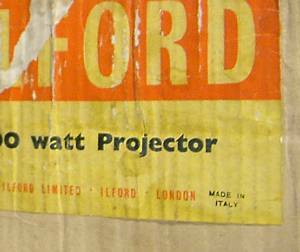 The pictures above and below left, of the 100-watt projector and its original box, have been supplied by David Muiggleton. Left is shown the Sportsman Projector with its sprung side doors hinged back, its detachable slide carrier in position and with two 35mm slides inserted. The 85mm focal length lens gives a 3feet wide picture (0.9m) at 9ft from the screen (2.75m), making it suitable for domestic use. as stated on the side of the Ilford Sportsman box. Also, see the Sportsman labels below. This example, sold on ebay, has a logo plate on the side door and also a label on the back. Notice how the inside slides out at the back for cleaning and bulb changing. Also, notice the air vents for natural convection cooling (no fan). The labels shown left and below are mssing from the projector shown above. Close ups of these two labels are shown here. Notice that the Sportsman projector was Made in Italy, whereas the Sportsman camera was made in West Germany. The 'Made in Italy' information also apperas on the box (above). Modern Camera Magazine test review, April 1957. This projector is particularly suitable for travelling. Closed and including the necessary leads tucked away inside it measures only 8 in. by 6 in. by 3 in., yet it is capable of giving a brilliantly sharp picture of a size suitable for any normal living-room when it is darkened, while in daylight it will show transparencies to great advantage on any relatively small white area such as a sheet of blotting paper or a 16 in. by 20 in. white mount. It is powered with a compact 100-watt bulb placed in well-designed double condenser optical system with silvered mirror. Incidentally, the whole of this optical system can be removed in one piece by undoing two small milled screws. The two condensers which are optically worked have between them a disc of heatproof glass. The slide holder is fitted with springs so that it holds either thin card mounts or glass-mounted slides quite firmly in position. The projection lens is an 85mm. f/3.5 anastigmat. For operation the red knob on the front plate is pressed whereupon the two side doors swing open and the slide holder can be inserted in a moment. There are two rubber feet at the back of the instrument and at the front a screw which can be used for raising and lowering the level so as to fit the picture accurately to the screen. The whole apparatus, which is of Italian manufacture, is excellently designed, well ventilated, with a handsome silver-grey hammered finish. The screen illumination is uniform, of surprisingly high intensity for a 100-watt lamp, and the definition of the projection lens is well up to standard. The price is £12 3s. 9d. including lamp. The Sportsview 35mm slide projector was marketed around autumn 1961 (?) and was much more sophisticated than the portable Sportsman projector (above). The Sportsview uses a DIN standard 2x2" (4x4cm) slide magazine (the one supplied holds 30 slides) and has a high light intensity A1/182 (150watt 240volt) projection lamp, fan cooled. Once the slides had been arranged into the magazine and the magazine had been inserted into the channel within the projector body, slides were changed using a simple push-pull manual autochange lever. The Sportsview was produced in Western Germany by the Dacora company, run by Herr Dangelmaier, the same company which produced the Sportsman cameras for Ilford. It was reviewed in 'Colour Photography' magazine, January 1963 issue. Interestingly, the review model is described as having an attractive silver-grey finish, with red and black trim, which sound to be a combination of the two variants illustrated here. The lens is a f2.8 85mm Rodenstock Splendar, claimed to give a picture 3feet (0.9m) wide from a 35mm transparency at an approximate projection distance of 8feet (2.5m). The black thumbwheel visible to the top left of the red Sportsview shown alongside (courtesy of David Muggleton) is the fine focus adjustment. The thumbwheel was set at a mid-point before starting a slide show and initially the projector was focussed using the helical screw thread lens mount. During a show, minor focus corrections, as might be required for some slides, was carried out using the thumbwheel. 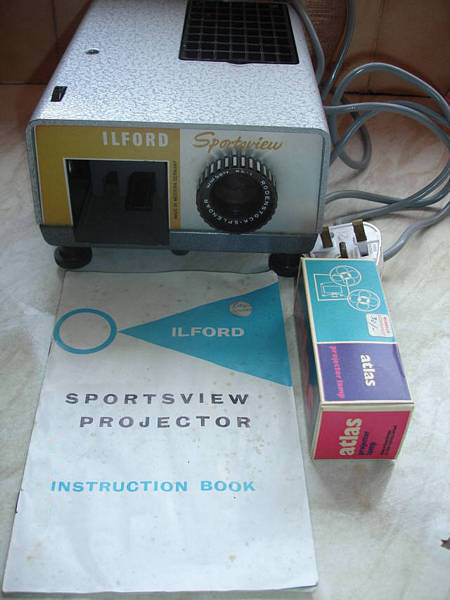 The Sportsview projector shown alongside was sold in an ebay auction and shows that the Sportsview was available in at least these two colours, red & bronze or yellow & light blue, though (see text above) the review sample in Colour Photography' magazine was silver-grey with red & black trim. The projector instruction manual, as shown in the picture, can be viewed as a 1.6MB pdf file by clicking on the icon, below. The 'Colour Photography' reviewer criticised it for its noisy slide change-over 'clank-clonk' but concluded "this minor point does not affect the good value, at £19.7s.6d (£19.38p). However, either the reviewer made a mistake or the price had substantially increased by the time of the January 1963 review. At Christmas 1962, an Ilford advertisement in Practical Photography magazine offered the Sportsview for £14.10s (£14.50p) including a 30-slide magazine. The lamp was 30shillings extra (£1.50p).